The more you’ve invested in something, the tougher it is to walk away…which is why you see rows of green or half-green tomatoes in the garage, basking on the kitchen windowsill or wrapped in newspaper in the basement, harvested in a hurry just before the first frost of the season. This easy slow cooker beef recipe is a good way to use up your underripe tomato windfall. 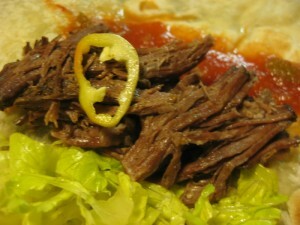 Serve this falling-apart-tender beef and the jus on thirsty hoagie buns, with warm tortillas and your favorite Tex-Mex condiments or over rice, with sautéed squash, onions and peppers on the side. A great addition, either served with the cooked beef or added to the slow cooker at the beginning: some pickled peppers. After you’ve shredded and served the beef, save any leftover cooking liquid. Use it in a killer batch of soup or chili the next day. Or you can reduce the cooking liquid down from a jus to a thicker sauce. Got a lot of green tomatoes? Chop and freeze for future batches of this easy entree. Coat the beef with the rub; place on a plate and set aside. Arrange the onion in the bottom of a 6-quart slow cooker. Cut the tomatoes into 2-inch pieces. Place in slow cooker and pour in the beef broth. Add the meat to the slow cooker; top with the garlic. Cover and cook nine hours on low. Remove meat from slow cooker and allow to rest, tented with foil, on a plate for a few minutes. Pour liquid from cooker through a strainer; save liquid and remove the fat (I like to use a fat separator, or you can skim the fat off the top). Discard the vegetables. Pull the meat into shreds, discarding fat and gristle. Heat the degreased cooking liquid; serve with the meat.